Hi, a few days ago I shared (on my Facebook page) that I had been colouring up a storm using the new Petal Passion Designer Series Paper (and how awesome is it that you can finally purchase it?! YAY!). Whilst I was happy enough to just colour the paper, I knew it would look amazing on a card. I used Stampin’ Blends to colour the paper and I have to say that end result is bright and vivid. I would normally shy away from such a loud paper but I *love* it and I’m going to show you a little tip on how to subdue the colour if it is too overwhelming for you. I cut the paper to size and mounted it on Basic Black cardstock. Next, I cut a piece of vellum so you could still see a border of the beautiful background. Yes, this is my tip – and isn’t it easy?! A panel of vellum is all you need. I put this aside and started working on my sentiment. I knew I wanted to use the big Happy Birthday thinlits die for the sentiment. I also knew that I wanted it to match the colours I had used in the background paper. Thinking that one colour might look too harsh, I opted for a shaded look. 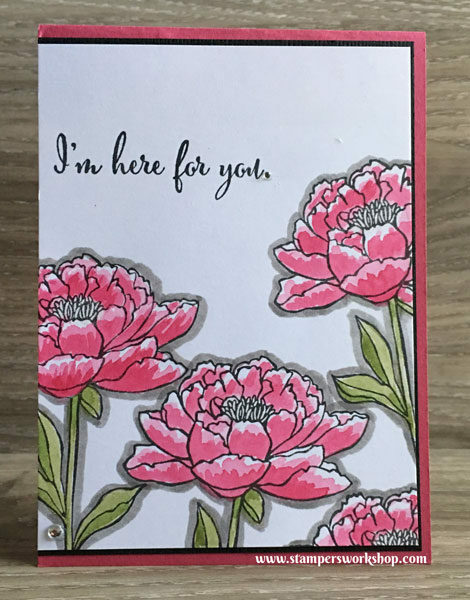 There are two ways you can shade the die cut – cut out the die first and then add colour, or add ink to the cardstock and then cut out the die. With the second option, I didn’t have to worry about accidentally catching and tearing any of the letters. I put down a layer of the Daffodil Delight ink starting at one end and then working towards the centre. Next, I took the Pumpkin Pie ink and sponged it from the other end towards the centre. I made sure that I applied a lighter coating of ink as I moved towards the centre – I wanted a nice gradient effect. I cut out a second sentiment from Basic Black cardstock so that I could ever so slightly offset it under the main sentiment. The touch of black helps the sentiment to really pop! Before I adhered the sentiment, I thought it needed something else. 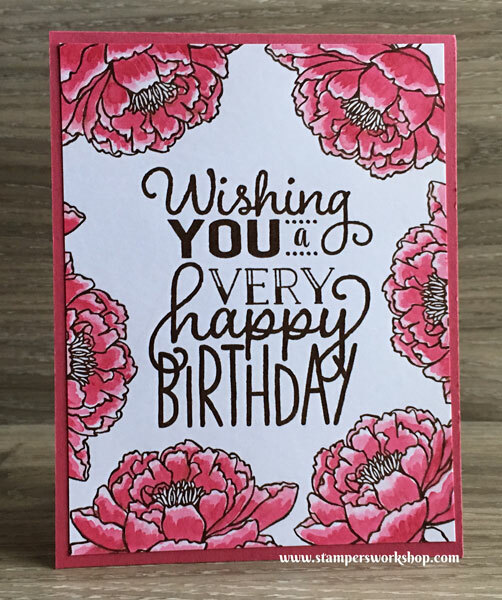 The “To You” sentiment comes from the Big on Birthdays stamp set and I love how it coordinates so beautifully with the big and bold Happy Birthday. I used Basic Black archival ink to stamp the sentiment. Normally, this ink dries very quickly and you can’t emboss with it, however, due to the slick surface of the vellum, it doesn’t dry quickly so you have time to add the embossing powder. Just be careful as you can easily smudge the ink (both when stamping and when applying the embossing powder). I used the fine tip glue to adhere the sentiment to the vellum. Have I told you how much I love this glue? It’s fantastic – plus the fine tip makes it so easy to add glue to small areas. Since you can see through vellum, a lot of adhesives also show through. Now, there are a few different ways you can adhere vellum, but for my card design, I was limited in choices. Here’s my tip: use the fine tip glue and trace the back of the sentiment as this hides the adhesive. I placed an acrylic block over the sentiment to hold it in place while it dried. I also put the smallest dot of glue in both of the bottom corners of the vellum panel to tack them in place. You can *just* see a little bit of the adhesive over the yellow flower but you cannot see it at all over the pink flower. WIN! Somebody stop me! I just cannot stop using the You’ve Got This stamp set from the 2016/2017 Annual Catalogue. Today’s cards are, once again, variations of the same theme but I hope you will enjoy seeing the different looks you can create. The cards are very simple to recreate and if you like colouring, you will love this stamp set! You might notice some of the cards are similar to cards I’ve previously posted. That’s okay! 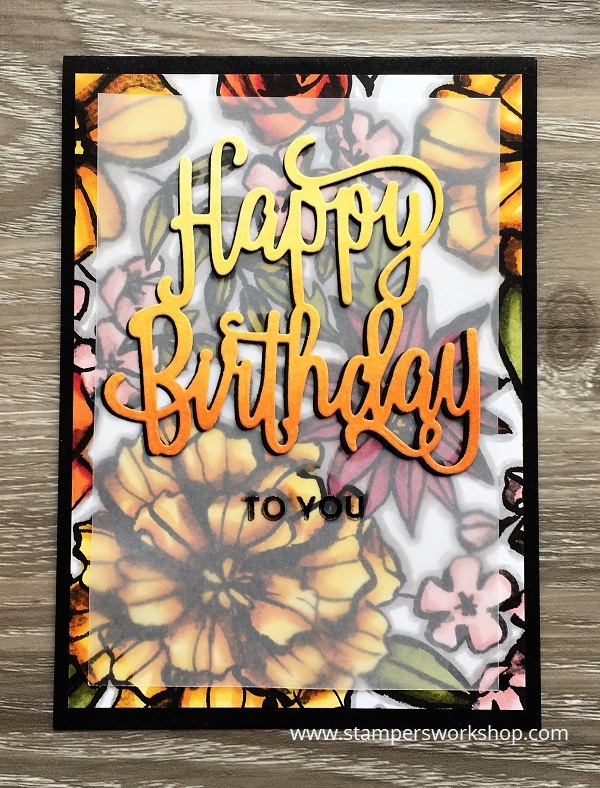 Don’t be afraid to try card designs you’ve previously tried but mix up the stamps you use, as well as the colours and embellishments. Okay, let’s get started! 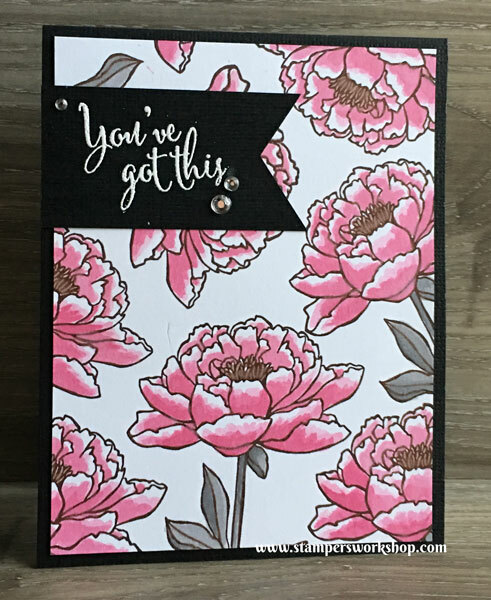 Materials used: Stamps – You’ve Got This, Diagonal Stripe Background; Stampin’ Write Markers – Melon Mambo, Wild Wasabi, Soft Suede; Black inkpad; Cardstock – Whisper White, Black; Wink of Stella and Rhinestones. By changing the sentiment and the colours used to finish the card, you have a “same, but different look”. 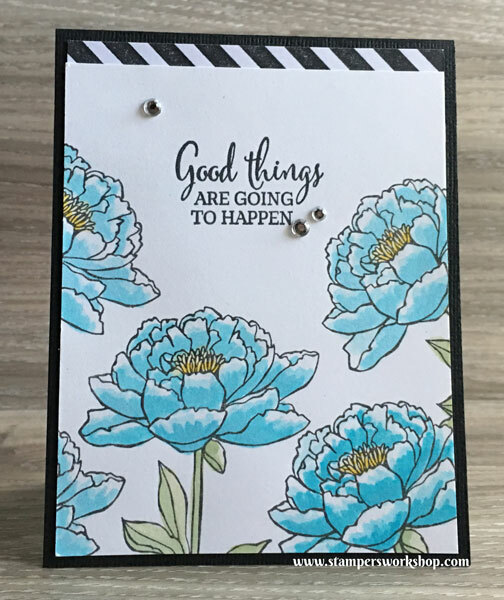 Materials used: Stamps – You’ve Got This, Diagonal Stripe Background; Stampin’ Write Markers – Tempting Turquoise, Wild Wasabi, Daffodil Delight; Black inkpad; Cardstock – Whisper White, Black; Wink of Stella and Rhinestones. Let’s change things up slightly. This time, let’s highlight the flowers with Smoky Slate. You could use a softer shade of gray or even a blue shade to highlight the images. You could also soften the edges to have it fade away. I also decided not to centre the stamped panel just to be a little different. 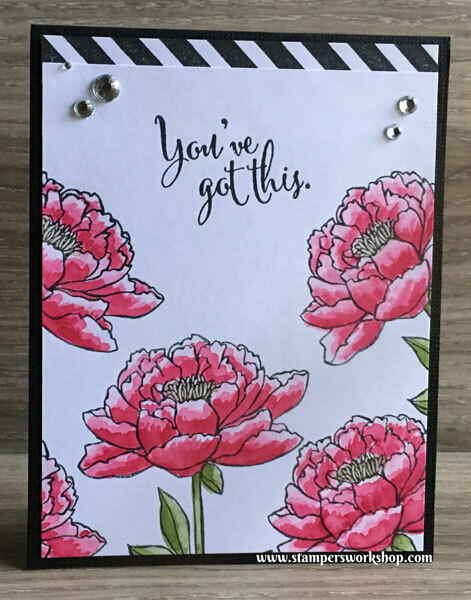 Materials used: Stamps – You’ve Got This; Stampin’ Write Markers – Melon Mambo, Wild Wasabi, Soft Suede, Smoky Slate; Black inkpad; Cardstock – Whisper White, Melon Mambo, Black; and Rhinestones. Next up is a super simple card! I’ve used one stamp pad to ink all the images, including the sentiment. Then I’ve used just one marker to colour all the flowers. By adding a little of the clear Wink of Stella to the image you give it a little shimmer to make it a bit more interesting. So simple! You can certainly add additional colours, shading, embellishments, etc, but don’t ever feel like you have to! Materials used: Stamps – You’ve Got This, Big on Birthdays; Stampin’ Write Markers – Melon Mambo; Classic Stampin’ Pad – Chocolate Chip; Cardstock – Whisper White, Melon Mambo; and Wink of Stella. The next two cards are based on other favourite designs of mine and I will have many, many more cards like this to share soon. Once I get started colouring, I usually end up making lots of these cards. First up, let’s change up the colour palette. 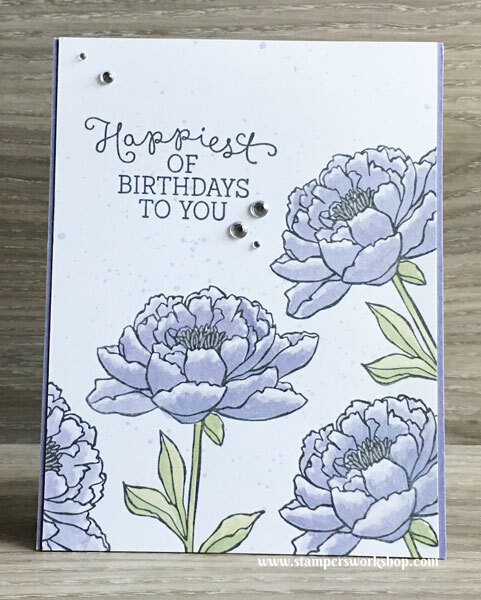 Materials used: Stamps – You’ve Got This, Birthday Blooms; Stampin’ Write Markers – Wisteria Wonder, Wild Wasabi, Smokey Slate; Black inkpad; Cardstock – Whisper White, Wisteria Wonder; and Rhinestones. And last card for today, is one I have just finished. I LOVE it! Materials used: Stamps – You’ve Got This; Stampin’ Write Markers – Melon Mambo, Chocolate Chip, Smoky Slate; Classic Stampin’ Pad – Chocolate Chip; Craft Stampin’ Pad – Whisper White; Embossing Powder – White; Cardstock – Whisper White, Black; and Rhinestones. I hope this inspires you to dig into your floral stamp images and colour away! Don’t forget Sale-A-Bration is still on! With every A$90.00 purchase, you are entitled to a free item from the Sale-A-Bration catalogue. From February 23, 2017, Stampin’ Up! has released three additional items to choose from. So fun!